Turquoise has been revered from the earliest times in the history of man. Considered the bridge between the earth and the sky. Coveted by Royalty, Mystics, and those fortunate enough to have the means to own it. 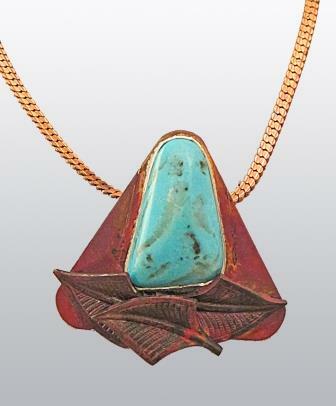 My work features exclusively Kingman Mine Turquoise, from the last remaining active mine in America. This turquoise has not been treated with any synthetic stabilizers or dyes. It's the real deal with a beautiful genuine patina'd setting for added elegance. ​Turquoise is found in Arizona, Alabama, California, Colorado, Nevada, New Jersey, New Mexico, Texas, and Virginia. During the 1970s, the Bureau of Mines stated, in terms of value, that Turquoise is the most sought after stone in the U.S. mining operations. Turquoise was the first stone in recorded history of man to be used as a gem according to the Library of Congress. The name Turquoise comes from French describing the stone that came from Polo reported turquoise in his travels in China. The Aztec Indians of Central America, who had in abundance the most prized ore of all, gold, traveled into our American Southwest to find turquoise. Turquoise was so valued by the Aztecs that they demanded turquoise as a tribute from neighboring states. Turquoise has been found in crypts dating from the First Dynasty in Egypt, over 7,000 years ago. Natural turquoise is naturally a soft and fragile stone. As such, it needs to be handled with care. Store turquoise by itself, not with other jewelry with hard stones or metals that could scratch it. Use of a jewelry pouch is advisable. Do not immerse in water. Our stones are backed with a cushion of sawdust that can expand and cause the stone to break. If you need to get dirt or food off the metal, just use a moist cloth with a bit of olive oil to rub it off. Turquoise is also easily damaged by solvents because it is a phosphate mineral. It should be protected from perfumes, skin lotions, hair sprays, sunscreens, and other cosmetics. These can damage the stone's surface polish. Contact with oils in the skin should be avoided as well for the same reason. Feel free to email with any questions you may have.